Endless right hand point breaks, gorgeous weather and close to Europe, it’s no wonder Morocco’s such a popular surf trip destination. 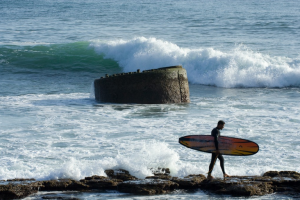 With everything from sheltered beach breaks to world-class point breaks, Morocco really does have a wave to cater to all needs, making it the perfect place for a chilled out surf trip where you can really improve your surfing. 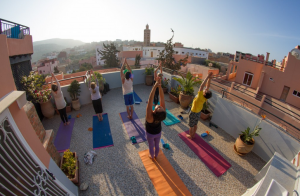 Based in the quiet, traditional village of Tamraght, 5 minutes from the better-known town of Taghazout, they have a gorgeous house, brilliant surf guides, yummy food and yoga. Mo’s been surfing the area for years and Lucie’s been out there teaching yoga for five, so you’ll be in knowledgeable hands. You really are spoilt for choice here, with six different beaches for beginners and more than a dozen other point and reef breaks for intermediates and advanced surfers. Beach breaks like Banana Beach, Crocodiles, Camel Point and Panoramas (next to Tagazout) are perfect for learning, but also ideal for progressing. We often found that although there’d be a couple of surf schools in the white water, you could usually find a peak out back pretty much to yourselves. For more experienced surfers, famous waves such as Anchor Point, Boilers, Mysteries and Killers are all within easy reach. Super consistent pretty much all year round, you’ll be like a kid in a sweet shop that doesn’t know which one to choose. 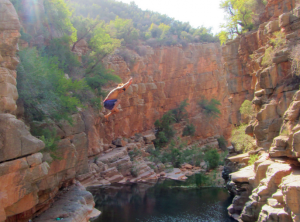 Morocco is definitely a place to take heed of the phrase ‘know your limits’. Although there are a load of beginner-friendly beach breaks, there are twice as many rocky point breaks and reefs as well as the odd ship wreck that will test you and hurt you if you don’t pay attention and show them respect. Not that I’m trying to scare you, but on a good day, the lovely, clean waves often look a lot friendlier than they are. Listen to your surf guide or check with the locals if you’re not sure. At Tamri, watch out for the rip at high tide going towards the rocks at the south of the beach. Surf Star has a great range of boards and wetsuits for you to use during your stay, included as part of your surf camp package. There are a couple of other places to rent boards in Tamraght, but for a wider selection you’ll need to go got Taghazout. It costs about €10-15 per day for a board and €6-10 per day for a wetsuit. Surf Berbere and Surf Maroc both have a good selection, and if you’re fussy about what you surf, it might be best to bring your own board. 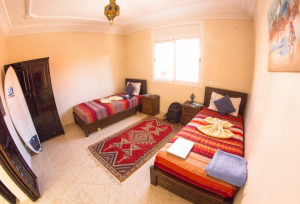 There are heaps of accommodation options in Taghazout. We stayed at Surf Berbere for a few days, who were super friendly and have a lovely roof top terrace. 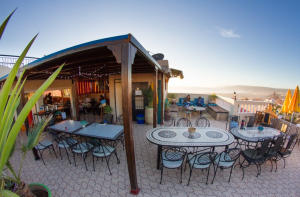 L’Auberge, which is run by Surf Maroc now, also gets great reviews. We hung out in their cafe/restaurant while were there… a lot. It’s got good wifi, great food and a friendly, chilled out vibe. When I was there, my friends were staying for a month, so we rented an apartment in Taghazout. It cost us less than €10 each per night, so was great value and definitely has it’s benefits if you’re staying a long time and you need to stretch your budget. It obviously doesn’t have the social side or give you access to all the local knowledge you get when you stay with a surf camp. 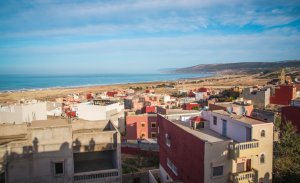 Tamraght is a beautiful, traditional village with a mix of surf camps and local Berbere families, all set amongst colourful buildings against the lovely backdrop of the sea. It’s generally a lot quieter and less touristy than neighbouring Taghazout, but there are still a few ocean view cafes and some great local restaurants. Most nightlife is centred around the surf camps. Surf Star concentrate on ‘chilled out social evenings’ and even throw in the odd beach party. Taghazout gets mixed reviews. Personally I really liked it, but I know other people find it a bit too touristy. It depends what you want and who you’re going with, but there’s a bigger selection of accommodation options and restaurants serving European food, as well as more surf shops. Tamraght and Taghazout are dry towns, alcohol isn’t forbidden, just not for sale. The nearest place you can buy it is Agadir, which is 30-45 minutes away in a taxi. Now I actually really enjoyed not being able to go for a drink easily, I definitely surfed better than I would have done with a raging hangover… that said, you can’t beat a post-surf beer. Stock up on the way from the airport. And even better, Surf Star have fridges especially for you can keep your beers cold! Agadir is the closest airport and you can fly there direct from loads of European airports. It’s just under an hour away from Tamraght and Taghazout. 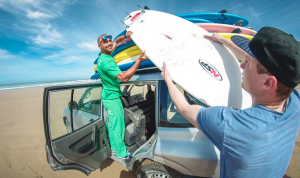 Most surf camps, including Surf Star, will pick you up from Agadir as long as you let them know in advance. Marrakesh is about 3 – 3.5 hours away by taxi. You can also get a bus to Agadir and then a taxi to Tamraght or Taghazout. We love Skyscanner for finding the best flights. Surf and yoga go hand in hand, and Lucie is one of the best yoga teachers I’ve had the pleasure of being taught by. You can sign up for a full yoga and surf camp or just take the odd class when you feel like it. 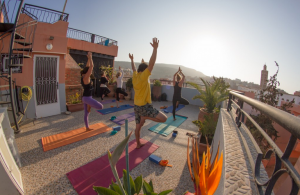 Each class is on the terrace with sunrise and mountain views in the morning, and ocean sunsets in the evening. I feel relaxed just writing about it. And if you need chilling out even more, you can also treat yourself to a massage and a Hammam skin scrub with wonderful local argan oil. Has the area’s largest souk and a lovely marina and beach. There are also several night clubs if you fancy a drink and a dance. You can also take a camel ride, go horse riding or even quad biking if you fancy some time out of the water or have a non-surfing other half! Almonds, honey and local argan oil, all blended to make a kind of runny peanut butter, only ten times better. Great to dunk chunks of fresh french bread in at breakfast, after-surf snack, midnight cravings… any time really. This stuff is highly addictive, but stock up while you’re there, it’s almost impossible to buy back home. A daily ritual in Morocco. Served steaming hot in elaborate silver tea pots with beautiful little glasses, you’ll find people drinking tea literally on every corner. Good tea is never rushed, take time to slow down, catch up with old or new friends and watch the ocean. Then every time you drink it at home you’ll be transported right back. Mmmmm, tagine, tender meats, slowly cooked in iconic conical dishes, with sweet dates or prunes, the saltiness of olives and preserved lemons and a heady combination of spices, these will be a staple part of your diet here. 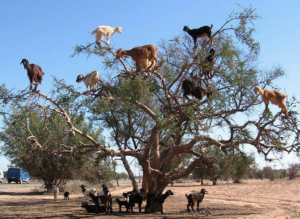 Well, because there’s something really funny about seeing 20 goats in a tree… trust me. good spot Nahid! Sorry about that, changing it now!